Wir schreiben das Jahr 2018 und die Ufologen sind dabei, ihre eigenen Untertassen-Fälle in Frage zu stellen, welche sie der Öffentlichkeit ständig als real verkaufen wollten. Dabei ist die Flucht in den Begriffwechsel von UFO´s in UAPs vorbereitet (im übrigen hatte CENAP schon in den 80igern den Begriff UAP in seinen Fragebogen aufgenommen, als wir die ersten Fälle von orangeroten Leuchtobjekten vorab nicht klären konnten. Bis wir den Hintergrund der Mini-Heißluftballons erkannten und somit der Begriff auch nicht zutraf für "unbekanntes atmosphärisches Phänomen". Nun hat man aber das Problem der Quantität der vielen "(Untertassen-Beobachtungen" welche man freudestrahlend in Datenbanken einpflegt und man sich die Frage stellt, für WAS und WEN. Untertassen-Fälle welche als Good UFO klassifiziert wurden (auch wenn man sie heute angeblich anders bewerten würde) und in Publikationen hochgehalten werden und zu Arbeitsprojekten heran gezogen werden,statt sie nochmals zu bewerten.. Und dann gibt es noch UFO-Promoter welche früher Raketenstarts als UFOs verkauften und heute "die Außerirdische Präsenz auf Erden" als real verkaufen. Größere Widersprüche findet man nirgendwo und es wäre der eigenen Sache dienlich sich endlich von den "Altlasten der Märchen-Ufologie" zu trennen. Auch wenn die UAP-Nottür sicherlich nicht den gewünschten Erfolg bringen wird wenn man die Basis der Recherche von Meldungen nicht verbessert. Hintergrundwissen zu den möglichen Stimulus muss gegeben sein und auch die ständige Erweiterung die mit immer neuer Stimulus notwendig sind. Auch wenn die Gefahr besteht sich einzugestehen sich Jahrzehnte selbst eteas vorgemacht zu haben. Nach 70 Jahren vermeintlicher UFO-Meldungen wäre es Zeit dafür. Years later, in 2011, I was one of the briefers at a private gathering in Washington DC, chaired by Bill Clinton’s former chief of staff John Podesta, who has a longstanding interest in the issue. It was reminiscent of an episode of The X-Files and there was even a former CIA director sitting at the back, playing no part in the discussion, but silently taking notes. I briefed attendees on the MoD’s use of the term “UAP” and the message clearly hit home. Now, some of the people formerly involved with the project – including the DIA official who ran it, Luis Elizondo – have joined a Public Benefit Corporation called To The Stars Academy of Arts & Science, fronted by Tom DeLonge, the former vocalist/guitarist and founder of pop punk band Blink-182. Their mission statement talks about creating a consortium “to explore exotic science and technologies … that can change the world”. If current US Congressional interest evolves into formal hearings, either specifically on AATIP, or on UAPs more generally, I hope they can get past debates about terminology, and avoid getting bogged down in statistical analyses. I have made clear my willingness to testify on the basis that my experience with the MoD might be relevant. Focusing on the quality of reports and not simply the quantity should result in a far more meaningful assessment of the phenomenon. Irrespective of the outcome, these might turn out to be the most fascinating Congressional hearings in history. • Nick Pope worked at the Ministry of Defence for 21 years. From 1991 to 1994 he was posted to a division where his duties included investigating UAP sightings to determine whether they had any defence significance. 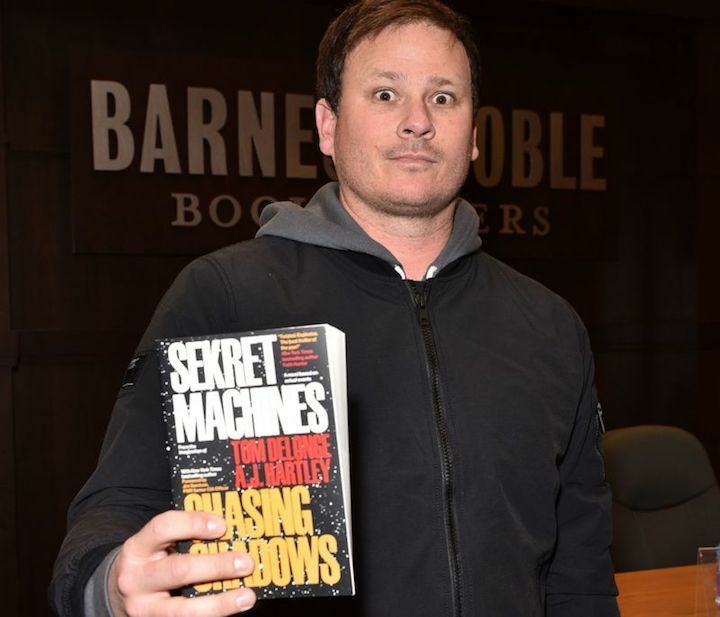 "If we posit an alien abduction taking place in ancient Israel, for instance..."
Tom DeLonge with one of his new novels about "The Phenomenon." A couple of years ago, I received a review copy of a book titled Sekret Machines: Gods, which was billed as an "investigation of the UFO phenomenon." The lead author was Tom DeLonge, a founder of the rock band Blink 182 and its former long-time lead singer. I'd been a fan of the irreverent band in my younger days, and my now-wife and I had attended a few concerts and enjoyed ourselves. It was difficult for me to imagine that the former lead singer of a band with an album titled Take Off Your Pants and Jacket had engaged in any kind of serious scholarship or research. Queen guitarist Brian May, however, went on to earn a PhD in astrophysics, so you never know. I made it about half way through the book before I gave up. The authors, DeLonge and Peter Levenda, spent most of the pages I slogged through cherry-picking ancient cultures and religion to find curious or unexplained things. Then, they attribute these experiences to mysterious alien influences. For example, amid a discussion of alien abductions and "the Titans, the Giants, and the Melians of ancient Greek mythology," the book provides this gem: "If we posit an alien abduction taking place in ancient Israel, for instance, it would have been recorded much the same way that Genesis recorded angels mating with humans and creating monsters." Indeed. All of these enigmas of ancient culture, we are told, provide evidence of something the authors dub "The Phenomenon." And what is this? Well, that's not really clear. This much we know: It's something hidden. something alien, and something just waiting for scholars to unlock. And DeLonge and his gang suggest they've found the key. The authors finally get around to explaining their intent on page 29: "Our goal is nothing less than a revolution in the hard sciences as well as the social sciences: a reevaluation of what we know about our function, our purpose in the cosmos, and the potential opportunities and possible threats that exist." If this kind of supernatural revolution is your thing, I can heartily recommend the book to you. If it's not, well, welcome to the club. I decided not to review the book because I felt it unkind to trash something that seemed like a heartfelt effort. (And hey, I liked his music). So I set the book aside. Only later, much later, did I learn that DeLonge parlayed these books into something called To the Stars Academy of Arts and Science Inc. This unassailable group is a team of former intelligence officials and various other experts along with DeLonge who "believe there are transformative discoveries within our reach that will revolutionize the human experience, but they can only be accomplished through the unrestricted support of breakthrough research, discovery and innovation." In other words, the evil government is covering all kinds of mysterious alien stuff up for its own nefarious purposes. And interested personages were invited to help the good guys. For a few hundred bucks, people could get a piece of an "A+ investment offering" from To the Stars, to assist its efforts to pull back the veil from the government cover-up and bring brilliant new technologies—such as beamed energy propulsion—into public view. By now, you've probably guessed where this is heading. And it's not a pretty place. A recent filingwith the US Securities and Exchange Commission tells the tale in black-and-white numbers. Put another way, after a year of fundraising, Tom DeLonge's alien conspiracy business is $37.4 million in debt. The financial filing states that To the Stars intends to remain in business over the next 12 months by selling additional stock. Their website says they accept credit cards, if you're so inclined to help keep the effort afloat. Bear in mind that any financial returns may be beyond the reach of even The Phenomenon, given the company's existing debt. I'm not sure what to say about a millionaire who parlays his or her fame into a business that raises funds from people who are not millionaires but desperately want to believe in aliens, or conspiracies, or hidden government technologies. Therefore, I'll let DeLonge say it for me, in Blink 182's hit song Aliens Exist, from 1999's Enema of the State: "We all know conspiracies are dumb." If only we all did.